Profits are the mother’s milk of economic, stock market, and portfolio growth. Employment and tax revenues are driven by profits, too. Nothing good happens unless there are profits and lots of them. So it is no wonder that we pay attention to the earnings of companies in the stock market quite closely. It’s quarterly report time for US stocks. If you just casually glance at the earnings news, you might think companies are having a great year. Many are beating expectations and reporting impressive revenues and profits. The markets reward companies for meeting expectations (as we shall see below). But the reality is that the S&P 500 is on track for a sixth straight drop in year-over-year earnings. How do companies keep continuing to beat expectations when earnings are falling? Their apparent success is explained partly by the fact that earnings reporting is a shell game, partly by the fact that not all businesses and industries are doing equally well, and partly by really bad earnings forecasting by the “experts.” It has been a while since we have looked at the whole earnings process. It turns out most companies are doing well, but a small group shows results so dismal that they weigh down the entire market. Worse, that group may not recover nearly as fast as some analysts think. We will see why in a little bit. First, though, I want to announce some business changes. Tony Sagami has moved from Mauldin Economics over to Mauldin Solutions, LLC, which is the name for my new investment advisory firm that will soon be making some rather significant announcements. In addition to being a great writer, Tony has deep experience in the investment advisory world. We first met decades ago when he was working for Bill Donoghue. Tony went from there to owning his own very successful advisory firm. He has worked for me at various companies over the years. He has just the mix of talents I need at Mauldin Solutions, so I’m excited to have his help. To fill Tony’s shoes at Mauldin Economics, another old friend and colleague, Patrick Watson, will take over as Yield Shark editor. He’ll keep helping me with Thoughts from the Frontline, continue co-editing Macro Growth & Income Alert with Robert Ross, and start writing the free weekly Connecting the Dots that Tony formerly produced. If that sounds like a lot of work for one person, it is; but Patrick is one of very few who can handle it. Incidentally, in today’s business world where so many relationships are temporary and superficial, I’m proud to say that Tony, Patrick, and I have been friends and colleagues in various ways for about thirty years now. They knew a much younger me from long before I began writing these letters. Through many twists and turns we’ve learned a lot together, and we’re only getting started. We will re-launch Connecting the Dots under Patrick’s stewardship next Tuesday, Nov. 1, by automatically sending it to everyone on the Thoughts from the Frontline list. I promise you will want to read it every Tuesday from now on. If for some strange reason you don’t, just click here to opt out of that list. Now on with our story. Before we look at the current quarter, I want to review just how crazy the whole earnings game is. You own stocks for two reasons. You either think the shares will gain value, or they will give you dividend income, or both. Neither will happen unless the company is making money or at least has the plausible hope of making money someday. Earnings reports are important because they tell us whether that’s happening. They’re important for a deeper reason, too. A company’s market value is essentially the present value of its expected future profits. Small changes in that “expected” number can have a kind of domino effect. Public-company executives know this and try to put their best feet forward. Analysts are supposed to see through such maneuvers and discern reality. They issue forecasts about companies, and then each quarter we get to see if the forecasts were right. Somehow this innocent-sounding exercise has evolved into a giant expectations shell game. For the most part, Wall Street doesn’t care if a company’s report is good or bad; it cares whether the results match, beat, or fall below the consensus analyst forecast. A company “wins” the game and earns a higher share price by delivering unexpectedly positive numbers. This creates all sorts of perverse consequences. Profit projections made one year out are usually way too optimistic. Over the next twelve months they fall steadily to a point just below the eventual actual number. Voila: a huge failure to deliver on the year’s goal gets transformed into a “we beat expectations” victory. This happens all the time, as Lebowitz shows in this chart for the same 17 quarters. The black line represents quarterly forecasts of earnings growth one year in the future. The green line shows that, six months later, earnings growth has been revised downwards in every instance. Earnings expectations continue to get revised lower as shown by the red line, which represents earnings expectations three months prior to their release. 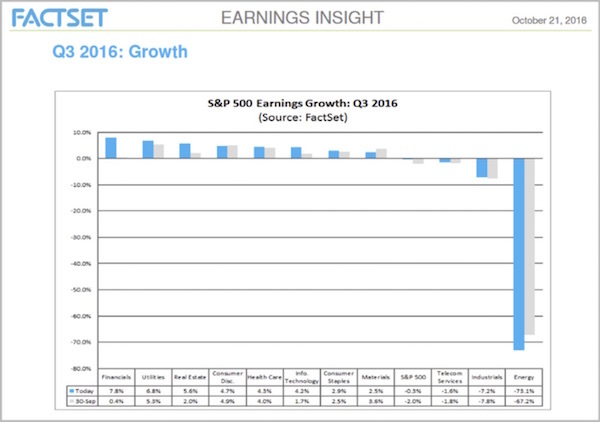 The yellow line shows expectations in the quarter that earnings are due to be released. 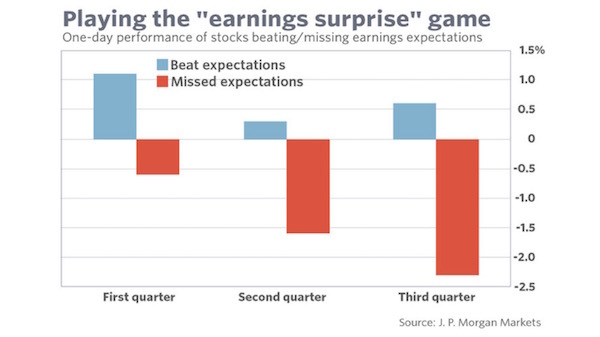 As you can see in every instance, earnings expectations are at their highest a year in advance, and lowest in the quarter they are due to be reported. Hardly a coincidence, we suspect. Indeed, this pattern is hardly coincidental. It resembles the sort of fact manipulation routinely practiced by political-messaging operatives. Early on, you tell people how wonderful the future will be when there’s no way anyone can prove you wrong. As reality draws nearer and the chances of looking foolish increase, you get more cautious. Then at the end you purposely dampen any enthusiasm so your voters (or investors) will get a pleasant surprise. Unexpected bad news is the absolute worst thing, for both Washington and Wall Street, so both work hard to avoid it – by intentionally disseminating information they know (or should know) to be wrong. They defend this practice by saying it’s better to err on the side of caution. That’s true, usually, but they are still erring on purpose instead of giving their honest opinions. You know where this goes next. Wall Street ears fill with “whisper numbers” that supposedly reflect the “real” estimates that analysts don’t publish. Who gets the whisper numbers, and when do they get them? The potential for abuse is obvious. People who get reliable whisper numbers can trade ahead of the unwashed public and disfavored institutions that must rely on published forecasts. The net result of this earnings forecast manipulation is a stock market with a last-minute bullish bias. 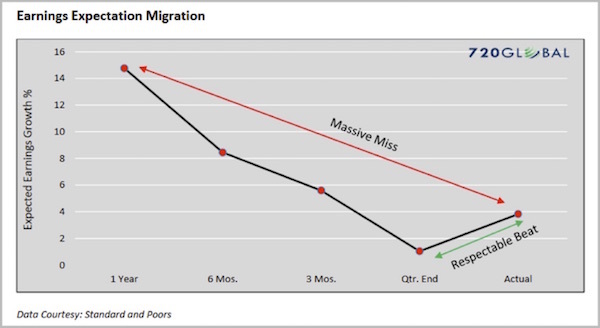 The rosy early forecasts convince investors to buy a stock, and then the lower last-minute revisions convince them not to sell even when results are nowhere near original expectations. Then, all these forecasts get aggregated into sector and market forecasts, convincing strategists to maintain or increase their allocations to stocks instead of other asset classes. Consider the percentage of recently-reporting companies that beat Wall Street’s expectations. Among the firms in the S&P 500 that have reported this earnings season, for example, 76.1% beat the analyst consensus and just 16.8% missed. Nor are these recent results a fluke. Over the last 16 quarters (or four years), according to Standard & Poor’s data, more than two-thirds of all S&P 500 companies’ earnings beat expectations. In no individual quarter was the share beating less than 63%. Beating expectations has now become expected, in other words. In contrast to the largely clueless analysts, however, investors appear to be seeing through the expectations game. They have stopped getting particularly excited by beating expectations, for example. At the same time, they severely punish companies that fail to clear the artificially low hurdle that their expectations game has created. I don’t think this phenomenon is the result of some nefarious conspiracy, but it might as well be. It is the fault of both company management and all-too-willing analysts responding to the incentives before them. It usually works… until it doesn’t – and I think we’re approaching a time when it won’t. Equity analysts are a big part of the problem. Their job should be getting those estimates right rather than taking what are clearly suspect numbers from companies and plugging them into their spreadsheets. The chart below is from my friends at Ned Davis Research. 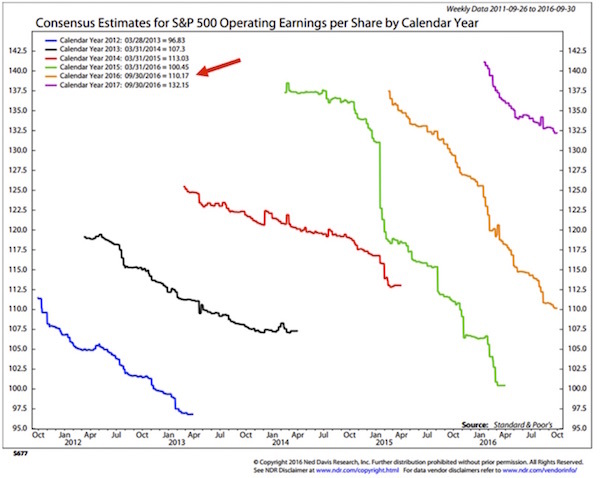 It shows the consensus estimates for S&P 500 operating earnings when those estimates are first created and then what happens to the estimates over time. This chart starts with the year 2012, and there has not been one year since that has not seen a significant revision downward of earnings forecasts. Note that initial estimates have been higher every year than the year before, except in 2016, and that the drop-off in earnings estimates was more precipitous in 2015 and 2016 than in prior years. In 2015 (the green line if you are seeing this in color), consensus estimates went from an initial forecast of $137 to barely above $100 by the end of the year. That is a huge miss – over 30%. But that expectations dive didn’t dismay the analysts, because they initially predicted roughly the same level of earnings for 2016; and as of September 30, it looked as though earnings are going to come in at roughly $110. For 2017, earnings predictions started above $140 and are now down to $132. In a world where GDP growth may be in the neighborhood of 2%, do you think it makes a whole lot of sense that earnings are going to grow by 20% in 2017? Really? Honest? And these are operating earnings – you know, what I called EBIBS: Earnings Before Interest and Bad Stuff. You can download this fascinating spreadsheet, which is a treasure trove of data maintained by my friend Howard Silverblatt at S&P, then open it and scroll down to about line 100, where you can see the comparisons of operating and reported earnings. Reported earnings are what go to the tax authorities and are in fact what companies really earned. What you will find is that reported earnings are generally lower, and sometimes a lot lower, than operating earnings. Surprise, surprise. When bullish analysts talk about the price-to-earnings ratio (P/E ratio) being roughly 20 today, they are using operating earnings in their calculation. If they used reported earnings, they would find that the P/E ratio is roughly 24, more than a 10% difference and certainly up in nosebleed territory. I should note that the much more useful CAPE (the cyclically adjusted P/E ratio created by Prof. Robert Shiller), today’s P/E is 26.79. That is back up in 2007 range and was exceeded only in the irrational markets of 2000 and 1929. And it’s higher than when the bear markets of 1901 and 1966 started. Digging a little farther, you find that analysts are projecting earnings to grow roughly 30% from where we sit today by the end of 2017. It rather boggles the mind that people take these estimates seriously. But that is the problem: a very large number of people and market advisors do, which is why, of course, you hear that you’ve got to be bullish and stay in the market. Because if earnings really do rise that much, a forecast of 2500 on the S&P is not unreasonable in this market environment. And so you get a lot of predictions of a big S&P 500 bull market in 2017. It won’t be long before Barron’s puts out its annual forecast issue. It will be interesting to see just how bullish the estimate for the S&P will be. Just a wild guess from me, but I bet the consensus will be somewhere in the 2400 range. It seems the Barron’s forecasters and the analysts running the S&P numbers are all drinking from the same well. That must be some mighty fine wáter. The S&P data does in fact show that earnings-per-share growth is increasing. That is good, right? Do we not want earnings to grow? Of course we do – but that’s not what is happening. What is happening is that companies are using the ultra-low interest rates the Federal Reserve has set to borrow money to do stock buybacks, which give us the illusion of growing earnings without actually increasing them – and creating a lot more debt on company balance sheets. 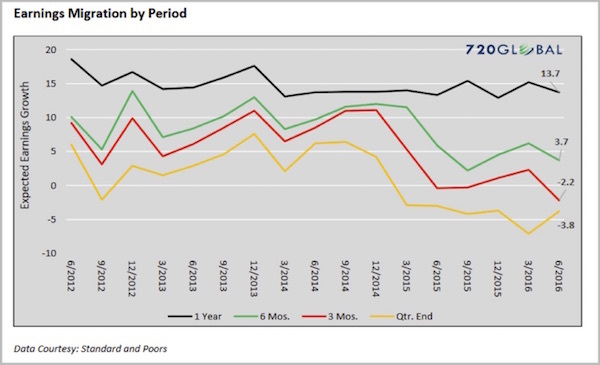 How have earnings actually done in real (inflation-adjusted) terms? That is a different story. This is data from Robert Shiller, who tracked earnings back to 1871. He then inflation-adjusted using 1983 as a starting point. 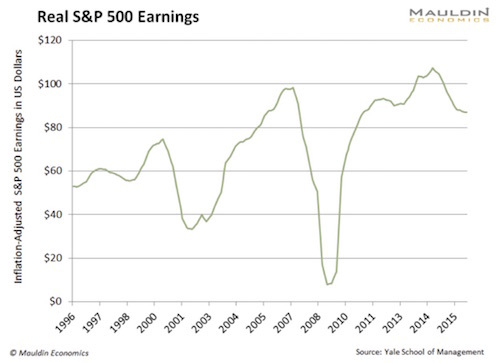 This chart, which starts in 1966, shows that earnings in real terms have fallen back below their 2006 peak. FactSet Research is another treasure trove of corporate financial data. They keep close tabs on S&P 500 company earnings – a tough job because that’s a constantly moving target: The numbers change every time a company reports or an analyst changes a forecast. The Energy sector has been important to corporate earnings for a long time, but perhaps even more so since oil prices plunged back in mid-2014. If this quarter brings another decline, it will be the first time the S&P has recorded six consecutive quarters of falling year-over-year earnings. Energy has been a big part of the fall-off. What you see here is this quarter’s earnings growth for all S&P 500 companies, broken down by sector. The blue bars are the latest numbers, using actual data for companies that reported before Oct. 21 and estimates for others that reported since then. Looking left to right, we see that Financials, Utilities, and Real Estate all had decent growth, with earnings rising 5% or more since the same quarter last year. Likewise, we see that Consumer Discretionary, Health Care, Technology, Consumer Staples, and Materials also grew earnings faster than the S&P 500 Index average. Telecom and Industrials were below average... and then there’s Energy. Earnings in that sector dropped 73.1% in the past year. Per FactSet, 26 of the 37 large-cap energy companies have either reported or are projected to report lower year-over-year earnings this quarter. Their combined falling earnings completely overwhelm the combined earnings gains of all other S&P 500 companies. Yes, all of them. Consequently, the S&P 500 earnings growth rate for the quarter just ended is -0.3%. If you exclude Energy, then growth would have been +3.3%. Not surprisingly, excluding Energy is exactly what lots of Wall Street people are doing when they talk to customers. The market is fine, they say, except for those dadgum energy companies. Now, I certainly see the point of excluding outliers when you evaluate a data set. They can cloud important changes in the middle of the curve. But if you’re going to exclude outliers, you should do it on both sides. If it’s fair to exclude extra-bearish energy, we should exclude extra-bullish Financials, too. But then the blended earnings growth is even lower than 3.3%, which is not so great in the first place. So no one does that. The reason we don’t have that ETF may be that Wall Street believes the earnings drought is about to end, thanks to higher oil prices that are surely coming in 2017. FactSet tracks those estimates, too. Here they are. Those green arrows show rising oil price estimates. Wall Street thinks WTI crude will average $55.88 by Q3 of next year, allowing Energy sector earnings to more than triple from this quarter. Can that really happen? Anything is possible. This rosy scenario would still show Energy earnings rising at a much slower pace than they declined from the last peak in 2014. This, in turn, allows analysts to presume nothing will go wrong in other sectors and the entire market will return to normal growth next year. 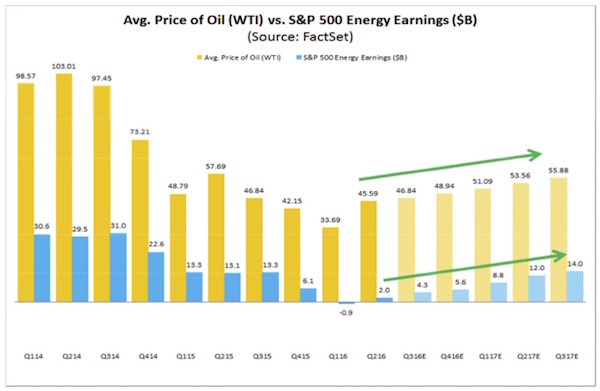 The Energy sector is actually projected to report the highest earnings growth (307%) and be the largest contributor to earnings growth for the entire S&P 500 for CY 2017, due in part to the expectation that the average price of oil in CY 2017 is expected to be nearly $54. Thus, any downward revisions to the estimated (average) price of oil for 2017 could result in analysts lowering expectations for expected earnings for the sector (and the index as whole) for 2017. I bolded that key phrase in parentheses. Hopes for S&P 500 profit growth in 2017 are highly dependent on rising oil prices. Oil isn’t quite everything, but it’s critical. 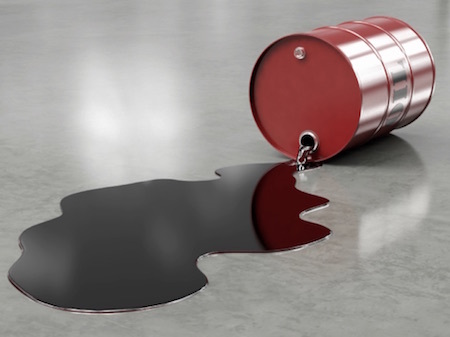 If oil doesn’t recover as projected – or some other problem emerges – Wall Street will have no choice but to revise valuations downward – which won’t be good for stock prices in any sector. The next question is whether oil prices will indeed recover as Wall Street presumes. That depends on the balance of supply and demand. Climate change agreements notwithstanding, the world still burns and will go on burning massive quantities of fossil fuel. Slowing economic growth has reduced energy demand growth, but the absolute numbers remain strong. This will change as greener technology spreads, but very slowly. The real mystery is on the supply side. We know OPEC is trying to agree on production quotas. They will meet in November to make a final decision. I’m not optimistic that they can reach a deal, and I have no illusions that they can enforce any deal they might reach when the vast majority of OPEC members will cheat. There’s also non-OPEC Russia to consider. Putin is in no position to reduce cash flow right now. The situation is further complicated by the fact that the US shale industry is the pivot point now, filling the role formerly held by Saudi Arabia. Our companies can dial production up and down quickly, too. Many observers have thought the shale industry would fall as many debt-laden companies went belly up. It hasn’t turned out that way. Energy investors have long hoped that falling prices would solve themselves by driving producers into bankruptcy and stanching the flood of excess supply. It turns out that while bankruptcy filings are up, they have barely impacted fossil-fuel markets. About 70 U.S. oil and gas companies filed for bankruptcy in 2015 and 2016. They now produce the equivalent of about 1 million barrels a day, about the same as before they declared bankruptcy, according to Wood Mackenzie. That represents about 5% of U.S. oil-and-gas output. That resilience has kept energy inventories flush and prices capped. Oil shot to $50 a barrel this summer, but has had trouble making much progress beyond that mark. On Friday, oil futures in New York rose 0.4% to $50.85 a barrel. This is exactly the way chapter 11 was meant to work. The process is designed to save companies that can be saved, and many energy companies are using it to lighten their heavy debt loads, adapt to lean times and keep producing. The same thing is happening in coal. The leading companies are all bankrupt, but production hasn’t missed a beat. I believe what’s happening here is that people are forgetting the concept of “sunk cost.” If you’ve already spent the money to locate oil and drill into it, pumping it out is not expensive. Your creditors will want you to do exactly that, too, so you can stay current on your payments. Go bankrupt and the court-appointed trustee will order you to pump. In addition, the new technologies I described last year (see “Riding the Energy Wave”) are making it profitable to drill and produce oil at ever-lower prices. The result is that more production comes on line every time prices rise to $50 or so. That seems to be the cap on WTI crude, at least for now. There are companies in the Permian basin that can reliably lift oil out of the ground and make a profit at $40 a barrel, and I am told that the same thing is happening in North Dakota’s Bakken. The last I read, the Permian Basin in West Texas had produced some 50 billion barrels since oil was first struck in West Texas in 1920. The naysayers were talking about running out of oil in West Texas in the ’70s. Present estimates are that there are another 50 billion barrels of recoverable oil in and around the Permian. And it is getting cheaper every quar ter to produce that oil. And gods only know how much gas is in those fields. The first LNG (liquid natural gas) export terminal in New Orleans is finally open, and there are others scheduled to open in the near future. These terminals are going to provide a massive new source of export earnings for energy companies and go a long way to help us lower the trade deficit. But the profits from that export business are not going to be showing up in any significant form in 2017. It will take awhile. This is the problem for stocks: Wall Street’s 2017 earnings forecast is not going to come true unless crude can punch its way higher, to the mid-$50s, and stay there. For that to happen, we would need to see some sustained combination of higher demand and/or lower supply. It’s not impossible, but I can’t tell you what would do it. We haven’t talked about currencies, either. The strong dollar has been cutting into the revenues of US multinationals. Many analysts think the dollar will change directions next year, too, and that shows up in their earnings projections. I’m the first to admit the greenback looks a tad overbought, but think about the competition. What other currency will get more attractive than the USD in the next year? The euro? Sterling? Yen? All the other major currencies have their own problems, far greater than the dollar’s. Yes, the US could well enter recession next year, and the Fed might cut rates, even into negative territory. But currency values are relative. The dollar may weaken, but everything else will weaken even more. One additional point: Investors are moving in a herd from active management to passive management, moving literally hundreds of billions of dollars into passive funds. Sometimes they do ring a bell. Bottom line: If you’re tempted to jump into US stocks with both feet, based on a 2017 earnings recovery, all I can say is “Good luck.” I think you’re going to need it. There is not all that much travel between now and the middle of January for me, which is good, as I have a lot of writing to do. I need to get to DC sometime in the middle of November for several meetings and to New York towards the first part of December. Then I have two conferences in Florida in January, and in the middle of February I have to be in the Cayman Islands – oh shucks. There will be lots of friends and fun in each of these locations, so life is generally going to be pretty good. I usually stay away from politics in this letter, as I know that a significant number of my readers would have a semi-visceral aversion to my personal politics. And since my “beat” is economics and finance and investments, I comment on politics only as it affects those realms. But this is my personal section, and I want to express something that is just confusing the heck out of me. As most longtime readers know, I was on the executive committee of the Republican Party of Texas for almost 20 years. I held many statewide posts and had significant roles in our conventions. I was on the finance committee and worked with lots of candidates and campaigns over the years. I am intimately involved with the mechanics of polling and consider myself somewhat of an aficionado of polling and demographics as applied to politics. Everywhere Donald Trump goes, he is in front of crowds of 10,000–20,000 people and sometimes 30,000. Vice presidential nominee Mike Pence is drawing reasonable support at smaller venues. Hillary Clinton is drawing less than half the numbers Trump does in head-to-head rallies, and sometimes only a few hundred people show up. I can see the polls and the pre-voting numbers on the one hand, and I see the enthusiasm of the Trump crowds on the other; and they just do not add up anything that I understand about the political process. I have now concluded that my understanding of this presidential race is somewhat like my understanding of China. Almost everywhere I go I am asked about my opinion of investing in China, and my answer is almost always, “I do not understand China, and there are 100 other countries that I think I can understand, so I will choose to go there with my money.” I am probably making a huge mistake, which would not be my first huge investment mistake and missed opportunity, but I do not understand China. And I do not understand this election. I will be throwing my usual election party, of course. Six weeks ago I thought it wouldn’t turn out to be an interesting night, as we’d just be watching the down-ballot races for Senate; but now I don’t know. Maybe the polls are right, and they call Florida early, and we cue Dandy Don. Then again, it could just get interesting. This is part and parcel of what I have been talking about from an investment standpoint: There is a significant part of the population – what we think of as the middle class – that has been left out of the party. I think this is the dynamic we are seeing in the political race; and if that is the case, then if you think 2016 is wild, just wait until 2020. I keep telling you to pay attention to the Italian referendum scheduled for December. It’s massively significant, and nobody is paying attention to it. It could affect the global economy more than the US election will. Seriously. I cannot state that strongly enough. As you no doubt know, because I keep promising it, I am in the middle of writing a book on what the next 20 years will look like. It’s called The Age of Transformation. The most difficult chapters to write are proving to be the chapters on the future of work and the distribution of income and wealth. The research I am doing is forcing me to rethink some of my core philosophical assumptions – things that I thought were fundamentally true. This is a very uncomfortable process for me personally. For 20 years I have had glib answers – most of which have been historically proven to be correct. But I am having to really come to grips with the concept that past performance is not indicative of future results. And that might be especially true when it comes to the future of work. I am horrified by the fact that I am even entertaining the possibility that William Gibson might be right. Gibson was the first true cyberpunk sci-fi writer (back in the ’90s with the writing of Neuromancer). He foresaw a dystopian world where the divide between those with assets and privilege and those without was shocking. Think Blade Runner. Something must be done to avoid such a truly obscene outcome, and all of the solutions I am coming to require me to rethink my core beliefs about economic and social reality. The basic issue is that those of us who are in the Protected class are going to have to figure out how to more equally distribute the benefits of our position in the future. And do not ask me how, because right now I do not know. And therein lies my angst. There is some irony in the fact that I am writing a book about the unbelievable pace of change that is going to impact our lives in the next 20 years, and I am faced with having to change far more than I thought I would have to. This presidential race is a mild taste of what we’re are going to be dealing with in the future. Fact is, 99.99% of us do not have the option of moving to some isolated spot and ignoring the world for the next 20 years. We are going to have to deal with it, up-front, close, and personal. I am truly excited about all the wonderful things that are going to happen. It is just the personal philosophical and operational adjustments that don’t thrill me.